Eric from Vienna put me onto the Triumph TR3A. His one was a rare factory hardtop with the Laycock Overdrive. 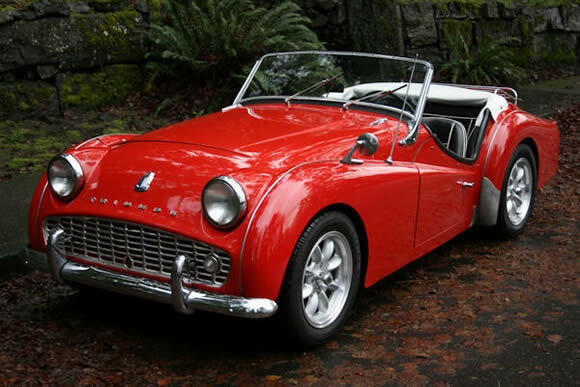 The Triumph TR3A was built between 1957 and 1962 and was facelift of the TR3. It did come with some handy features part from the new grill; exterior door handles, lockable boot handle and came with a full tool kit as standard. Excellent. Something handy that was an option on the TR3. Even though the TR3A was a very popular car it was seen by Triumph as a stand in while they got the TR4 ready for production. They made the 2.1 litre made for the TR4 available for the TR3A. Although not many were meant to be fitted the 2.1 would have made the TR3A a very quick car. You can still see TR3A's racing and even though they are 50 years old they are still competitive. It sure is Bob. Like your site - http://triumph-tr3.com/blog/.